Considering all of these features the radio is exceptionally easy to use, with a Power button, Volume and Tuning knobs and preset buttons- all are standard and clearly marked. Dedicated buttons control functions such as Weather Alert and Nap Timer. Other menus are well-coordinated and easy to access. For example: Pressing the Volume knob brings up the Bass and Treble controls (+5/- 5). Pressing the Tuning Knob starts Auto Scan. You can also turn that knob Up or Down to tune manually, then the next time you push it, it will Auto Scan in that direction…it’s nice to be able to Auto Scan Up or Down. I wish my car radio would do that. Other menus are accessed by pressing either the Source or Info/Menu button. With the radio on, pressing Source switches among FM1, FM2, AM, WX (Weather), BT (Bluetooth), Aux – it couldn’t be simpler. With the radio off, the Source button enters various setting modes, including Tuning Steps. The Info/Menu button access RBDS settings and Loudness On/Off. There is a small slide switch Inside the battery compartment to set the U4 for standard or rechargeable batteries. The U4 is an extremely versatile unit. It provides all the features one would expect of such radios and even more, such as built-in AC power along with the ability to run on external 12 volts via a commonly available car power adapter, the ability to run on 6 standard or rechargeable D cells with a built-in charger (it also requires two AA cells for clock and memory functions). Other features include NOAA Weather with Alert, USB Charging of external devices, FM RBDS with Auto Clock set and the usual complement of timers, alarms, snooze and even a Nap Timer and an Aux In jack…the list goes on and on. One comment which applies to all NOAA Weather radios with the Alert feature. This is a potentially life-saving feature and when threatening weather is possible its value cannot be overstated. But be aware that when the Alert Mode is activated, the radio is “listening” for an Alert signal to tell the radio when to alert you. In other words, the radio is actually receiving the signal continuously, even though the radio appears to be Off until an alert comes. This means that if you are going to use the Alert mode for an extended period of time, you should be using external power or your batteries will eventually be drained. As I said this applies to all battery-powered radios with the Alert feature but since I didn’t see it in the Owner’s Manual I wanted to mention it here. Performance: The U4 provides rich, powerful audio well suited to large rooms and outdoor or noisy worksite settings, but no matter where you use it, it has a nice, full sound you can customize to your taste with its versatile and simple tone controls and switchable loudness control…this is a nice sounding unit. 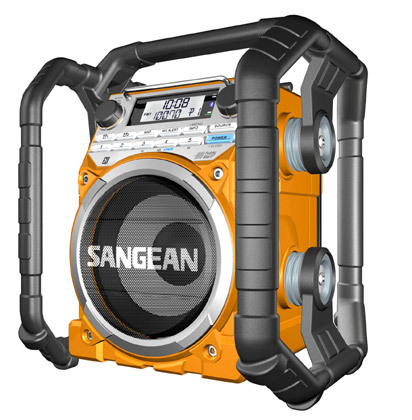 It is described by Sangean as Ultra-rugged – with its roll bar protection as well as certified dirt and moisture proof design I would agree with that description. The U4 also has a very good AM tuner, ranking 3 1/2 Stars on my AM Mega Shootout article. This means it will perform better than many other radios of this type with strong AM reception and great sound that makes most typical portable radios sound anemic by comparison. The FM is an interesting story. The actual FM tuner in the U4 is excellent, and would rank as a solid 4-Star performer in the FM Mega Shootout Article. However, it is hampered by the short, 6-inch rubber duckie style rod antenna, a design obviously chosen for its ruggedness. Standard metal rod antennas invariably get bent or broken on radios that live tough lives, and for a radio that will have to withstand abuse it’s a reasonable choice. However, its short length does limit the amount of signal that gets to the FM tuner. It’s not bad…it’s just not super sensitive to weak out of town signals as it could have been with a standard telescoping rod antenna. Luckily there are easy work-arounds for those who want to hot-rod their U4’s for better FM reception. Simply get a clip lead or any short 2 to 4 foot wire with an alligator clip on the end, and clip it to the metal base of the antenna. 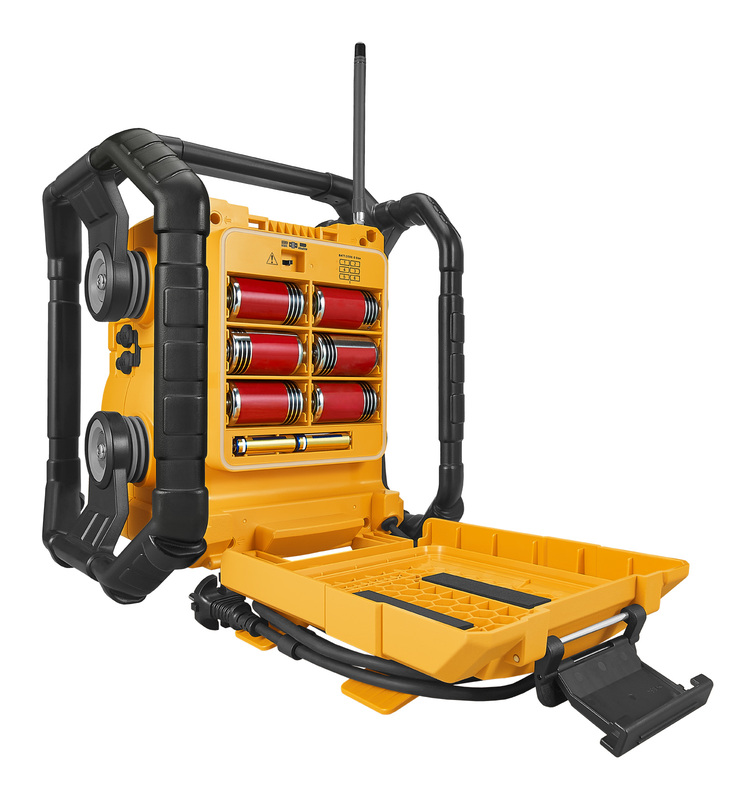 Alternately you can grab almost any kind of wire about 2 to 4 feet long, wrap 4 – 6 turns of it around the rubber duckie (no actual electrical connection is needed) and that extra wire will bring the U4’s FM sensitivity up to the level of other excellent FM radios for little or no cost. If you don’t want to bother with that you might try extending the AC power cord (whether you are using AC power or not) …this can also have some effect on weak signal sensitivity. But these measures are not generally necessary unless you want to hear very weak signals…most users will find the supplied antenna adequate for normal FM reception. FM rates Four Stars in the FM Mega Shootout list with the hot-rodded wire, about 2 stars without it. 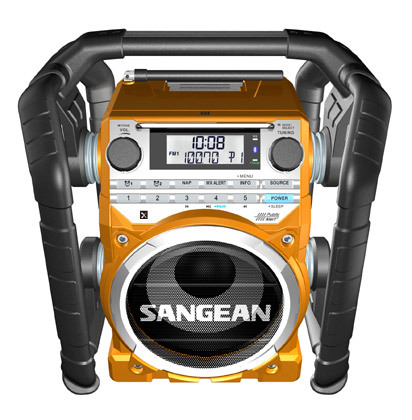 The Sangean U4 certainly has a lot going for it. 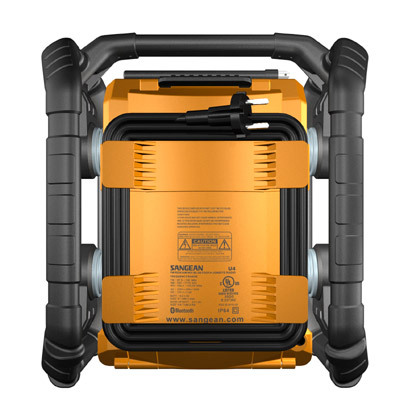 It is ideal for large rooms, job sites and outdoor areas where ruggedness and powerful audio are the most important criteria, and it is exceptionally flexible in terms of power sources and general convenience features. It is also as rugged and damage-proof as any such radio I have seen, and is overall is among the finest I have seen. Recommended!